Doves, sparrows, juncos, towhees, and thrushes naturally forage on the ground. Yet calling them ground-feeding birds can be misleading. While they will readily come to feeders close to the ground, having a table-like surface such as an open tray or fly-thru feeder can bring them up higher. Your tray or fly-thru feeder will also get used by perching birds such as chickadees, nuthatches and finches. Try hanging these feeders from a shepherd’s hook, a branch or an eave. You can mount one off a fence, a deck, a wall or on top of a pole. To increase traffic, install your tray or fly-thru feeder a short distance from a tree or shrub. Feeders installed 3 feet or closer to a window offer unmatched views and reduce the chance of serious injuries from window strikes. 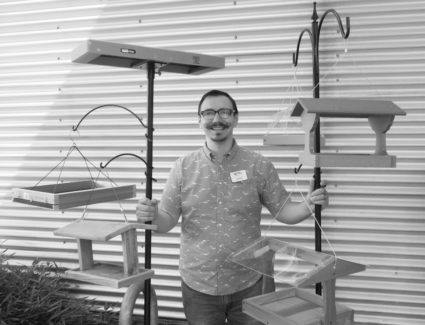 With wintering birds coming back, now is a great time to try an elevated tray or fly-thru feeder.